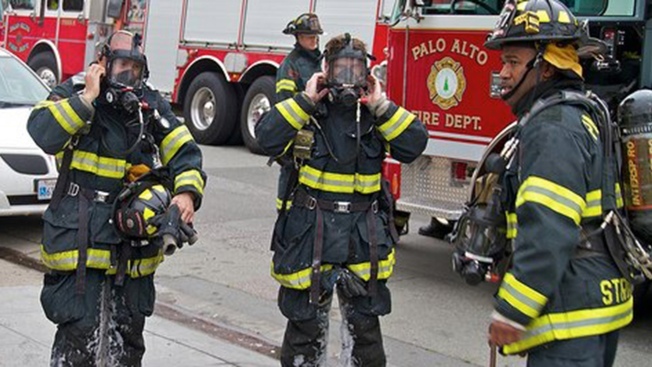 Firefighters knocked down a three-alarm fire that broke out early Saturday in a room with bio-hazardous waste, triggering a hazmat situation at the Stanford Medical School, Palo Alto fire officials said. The blaze broke out in a third-floor room of the Edwards Building at 300 Pasteur Drive before 8 a.m. Hazmat and decontamination crews were on hand, officials said, and roads in the vicinity of Welch Drive and Pasteur Road were shut down. Although the area surrounding the room on fire was evacuated, a sprinkler system contained the flames to a single unit, which firefighters then extinguished, according to officials. The fire did not impact patient care at Stanford Hospital, and no injuries have been reported, they said. Sixty firefighters from departments across San Mateo and Santa Clara counties responded to the fire, according to Palo Alto fire officials. Nine engines, five trucks, one hazmat team, two ambulances and five command chiefs were also at the scene. Crews began cleaning up around 10:20 a.m., fire officials said on Twitter. Firefighters are still working to determine what caught fire and whether any hazardous materials were affected by heat or smoke, Deputy Chief Catherine Capriles said. Both fire and haz mat emergencies are under control at @StanfordMed Building. Crews starting clean up. Fire is knocked down. Haz Mat issues continue. Sprinkler system has contained the fire to a room on the 3rd floor. A 2nd alarm and haz mat response has been requested. Crews have made their way to the 3rd floor. Fire sprinkler has activated. Fire crews responding to a report of a fire on the 2nd or 3rd floor of Stanford Hospital - Edwards Building. Report of a room on fire.